Ankle weights can be a great way to make your workouts tougher. There’s all kinds of exercises they can be added to! My personal favorite and recommendation goes to the Nordic Lifting Ankle/Wrist Weights. These are available in a few different weights (1, 2, 3 or 5 lbs on each weight), and all of them are very comfortable to wear. I’ve been using ankle weights for years already. I’ve been a serious competitor in Muay Thai for years, and the advantages of using leg weights should be obvious for a martial art famous for its’ powerful kicks and knee strikes. When I hit the level of international competition, I knew that an edge was needed – so in came the ankle weights! Now don’t get me wrong, these weights can help you no matter what your goals are. Whether you’re an athlete or just looking for toning, weight loss or strength gains, ankle weights can definitely be helpful to you. Adding them to aerobic workouts, bodyweight exercises, or to runs will all give you benefits. In this breakdown I’ve also picked through the rest of the ankle weight market to give you some different recommendations, depending on your situation, as well as some detailed info on why each selection was made. These weights are my top pick all around. The varied weights mean there’s something for every type of user. The light weights can be worn for longer time periods while going about your business to add extra calorie burn or toning, and there are heavier options for more effect with exercise. Nordic Lifting’s main benefits are that these are extremely comfortable and have a Velcro strap, making it easy to adjust them for your exact size. Both weights are covered with neoprene, and there’s also a reflective surface. A carry bag is also included. These weights are completely made from neoprene, a very soft and comfortable material to have against your skin. The design means the Velcro strap feeds through its’ buckle easily, and is kept away from your skin so there’s very little risk of scratching. The weight inside is also well positioned and secured, it won’t slide around or bang into your leg. All of this combines to give you a very comfortable ankle weight, which is both easy and safe to use. The safety of the design is added to by the reflective strip. It’s already safe for you to use and won’t cause any injury because it sits nice and comfy. The reflective strip also keeps you safer if you’re using these outdoors in the dark. Another safety factor is how well the weights stay fastened. If they come loose at all, it could risk injury or create imbalances. Besides, if they fall off they could also become damaged or get lost, so ankle weights have to be well secured! On top of the comfort and safety features, there’s a carry bag included which makes it easy to take these off and carry them around. Nordic Lift ankle weights are also convenient because you can use them for your wrists OR ankles, and the neoprene design stays clean better than most other materials would. The sizing is just right too, not too big and bulky, yet not small enough to leave exposed Velcro or too much weight in one area. Price for these is more than some other brands and definitely more than generic style weights. That could be a drawback for some people, though I consider this a fair cost for the quality provided. With a 5lb cap at the top end, these aren’t the heaviest weights available, so they might not be right for you – depending on your goals. For outright strength building, heavier weights are likely to be needed, but for rehab or toning use, these should be fine. 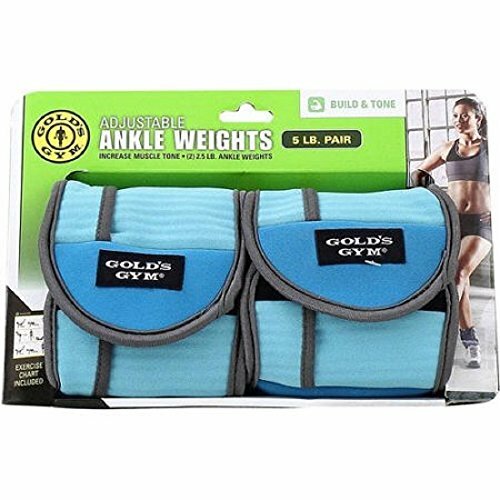 Golds Gym provide quality products, and their ankle weights are no different. You can get these in a variety of sizes, with our beginner recommendation being the lightest ones (2.5lbs). This is because you can remove the weight on 0.5lb intervals, so it can go as light as 0.5lbs on each side, or up to 2.5lbs. These are some of the cheapest ankle weights available, so it’s a great starting point. You don’t need to invest much to grab a pair and try them out. Being able to switch from a very low weight (0.5lbs) to heaver weights gives these more uses. Firstly you can change the weights for different exercises. Secondly, you can up the weight as you develop and need a heavier weight, so that the improvements keep coming. There is the option to buy heavier versions too, all of which are adjustable as well. Another set that fits well and snugly on to your ankle or wrist. Heavier weights do start to get a little uncomfortable though, so be aware there are better options for heavy weight users. 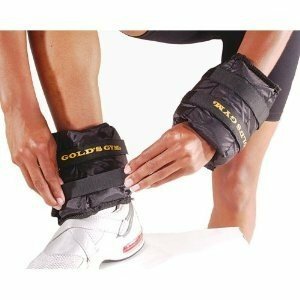 The overall reliability of Golds Gym Ankle Weights is quite good. The drawback is their adjustable design, which gives a lot of different pockets with their own fastenings and stitching. Over time one of these compartments might start to wear out and could even tear or leave a weight to fall out, so be careful and inspect your set regularly. 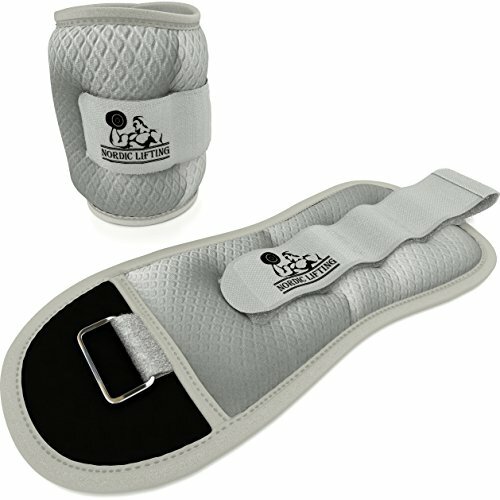 These are a great creation which are aimed at a different market segment to normal ankle weights. These ones are waterproof, so they’re great for outdoor runners who might get wet. They’re also wonderful for use in a swimming pool, which can be a great way to rehab an injury or build strength without placing much strain on joints. These have no issues with getting wet, whether outdoors or in a pool. In fact they’re designed to fit well so they won’t be affected by water and start floating or anything. Additionally, they also dry quickly and easily, and the nylon outer layer keeps the weights inside safe from any water damage too. The close fit and nylon material also combine to make it gentle on your skin. CAP’s aquatic weights don’t add pressure in any weird places either and stay nice and secure to your body. Despite being a unique item because of their waterproof capability, the cost stays reasonable. They are priced similar to any decent ankle weight and cheaper than many, so it’s a real bargain if aquatic ankle weights are what you need. CAP Aquatic ankle weights are available as 1.5 or 2.5 lb versions, but there are no other options, so the benefits are limited. With aquatic weights it would be nice to see a bigger weight range, because heavier weights could be really useful for hydro-therapy and other recovery or low impact activities. For anybody needing heavier weights than usual, these adjustable weights are perfect. 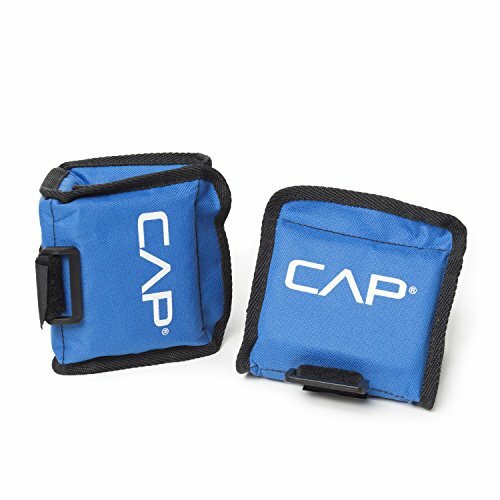 CAP have created an ankle/wrist weight which caps out at 10 lbs each side. The weights are still adjustable so you can remove some and lower the weight down to 2lbs and increase from there in 2lb intervals. Being able to take the weight as low as 2 lbs per side is great for all users, because this is quite a manageable weight for most people. From there the weight can go up as high as 10 lbs each side, which is quite heavy for an ankle/wrist weight. Having this high a limit means you can use them for a long time, increasing the weight as you go. It also lets you use heavier weights for certain exercises, which can give more options. For example, doing a pull-up with 2lb weights won’t make much difference, but adding a total of 20 lbs (10 each leg) is going to make things much tougher. For the amount of weight you get, these barbell adjustable ankle weights work out as a real bargain. In terms of price they match many lighter ankle weights while still keeping the quality high. Simply opening the well-secured sections and removing a weight pack is easy to do. It’s simple to place them back in as well, and the fastenings are secure enough to hold everything in place. The entire weight itself might rotate a little during use though. Of course the drawback to having a lot of weight available is that they can become bulky. That means they take up more room and can even affect your balance a little. Also wearing these under tighter clothing could be a problem, because they won’t fit. 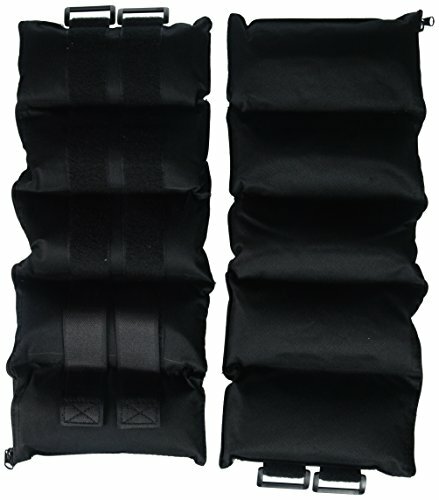 Using such a high weight with a basic design, created for functionality, can make the CAP adjustable barbell ankle weights uncomfortable to wear. This shouldn’t actually be a problem because they’re not really designed for long periods of use. This type of weight is more suited to quicker workouts. That’s because the heavier weight makes a real difference on these shorter, more intense sessions. These are made from a material which is also a little rougher and less comfortable against the skin. The big size of these could be good because you can attach them at thicker points of the arm or leg. The problem is they could also be loose fitting if you have thin ankles or wrists, which a lot of people do. For these users I’d recommend something like the Nordic Lifting Ankle Weights.